All the Exclusive Pictures from Yuvika & Prince's Wedding are here! 2018 has definitely been a year full of celebrity weddings. From television to movie stars, everyone decided to get hitched in 2018. And we have received more entertainment from their wedding than their TV series/movies! Prince Narula and Yuvika Chaudhary, the ‘it’ couple of Big Boss tied the knot in a beautiful beach wedding in Mumbai this year. And guess what we have? The exclusive pictures of ALL their ceremonies shot beautifully by Epic Stories! Their mehendi ceremony was an intimate affair with close friends & family where Yuvika chose to wear a fluorescent green lehenga with curled hair and looked too cute to handle! The engagement was followed by a grand sangeet. 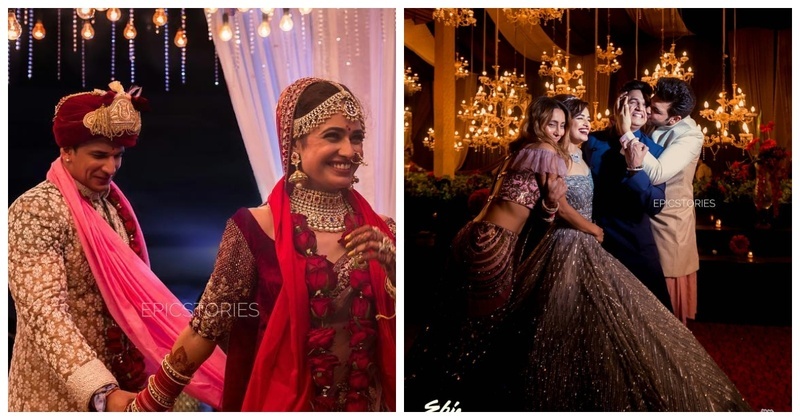 The entire TV fraternity was there to celebrate with the couple and the night was filled with some really dramatic dances, fun and quirky pictures.